You have to catch their eyes with your Pin images. You have to grab their attention with your titles. You have to have clean, easy to read images that tells them exactly why they must need your content. Do your images make the cut? or are you still struggling? Are you a brand new blogger looking for the best way to get noticed on Pinterest? Can you not seem to gain traction on Pinterest no matter what you try? Are you a blogger without an ounce of design sense, who wouldn't know how to create a pretty image if her life depended on it? Keep Reading! I’ve got the help you need! Introducing the Powerful Pin Design Bundle! 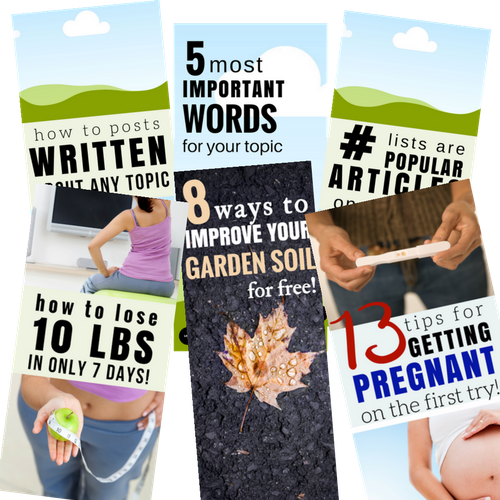 The help you need to create Powerful Pin Graphics that get noticed! With tips for creating pins that are irresistible on Pinterest, The Powerful Pin Design Bundle takes the guesswork out of creating images. You will know what to include in each and every pin AND by using the templates you can start to design images yourself no matter what your skill level (or eye for design!). Get My Design Bundle Now! The templates are ready to use- just swap out your headline text and your images and you are ready to go! Not a designer? No problem. Both the guide and the templates walk you through how to make images that get noticed on Pinterest! You can easily customize the look and feel of the templates. Switch fonts, colors, and images to make images that are unique to you! Access to examples of pins made using the templates. 10 Customizable Pin Templates made in Canva. Tips on how to edit the templates to fit your needs. “Sarah’s Pinterest bundle is the ultimate tool to help you create beautiful pins to increase traffic to your blog! Do I need any special software to use the templates? 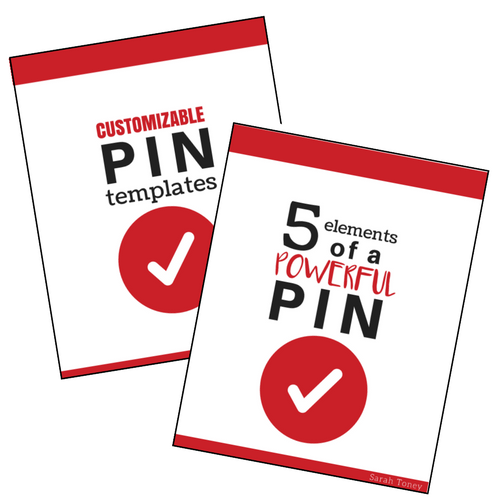 The 10 customizable pin templates are available through Canva.com. This is a free graphic design website- all you need to do is sign up for a free account and you are ready to go! I am a total blogging beginner. Is this product for me? Yes! When you are just starting out it’s easy to get overwhelmed with everything there is to learn and do. The Powerful Pin Design Bundle takes away some of that overwhelm by giving tips on how to create great pins for Pinterest AND gives you the tools to do just that. I am a seasoned blogger. Do I need this product? That depends. Are you happy with your traffic that comes from Pinterest each month? Do your images result in a lot of click-thrus and repins? Then probably not. However, if your images just aren’t gaining traction no matter what strategy you use. Maybe something is missing in your design and these templates and tips will help you bridge the gap. Will this product bring me tons of traffic and tons of income from my blog? Unfortunately, I can’t promise that. There are a lot of variables that go into what goes viral on Pinterest. Your pinning strategy, your niche, your SEO, etc. The Powerful Pin Design Bundle focuses mostly on creating IMAGES that are bright, bold, and talk directly to your audience. So while, I wish I could promise you amazing blogging success, this is just one piece of a much larger puzzle. As this is a digital product, I do not offer refunds at this time. However, if you run into any problems using the templates or have questions in implementing the information given in the guides, you can contact me at any time at sarah@ powerfulpinning. com (minus the spaces). If I didn’t answer all of your questions, feel free to drop me a line anytime.